Purchased by the Leichtag Foundation in December 2012, Leichtag Commons is an amazing place where social enterprise, innovative agriculture, educational programs, and vibrant community life come together. The Commons is home to Coastal Roots Farm, which includes an in-ground production farm, vineyard, food forest and more; The Hive, a co-working space for over 30 non-profits and social entrepreneurs; and more than 900,000 square feet of greenhouse space occupied by seven agricultural tenants. 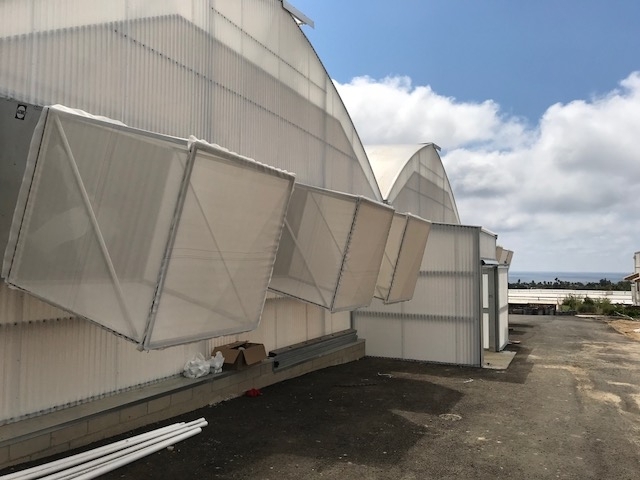 Consisting of three zones containing two greenhouses each, this project had its own set of highly unique challenges, primarily because it's situated on a slope that drops nine feet over 240 feet. But by working with ATI Sales Engineer Jim Bergantz, John Pound, Anita Pound for the design of this one-of-a-kind group of structures that equal one total acre in size, Sawyer is happy with the results and anticipating its completion by this summer, Sawyer said. 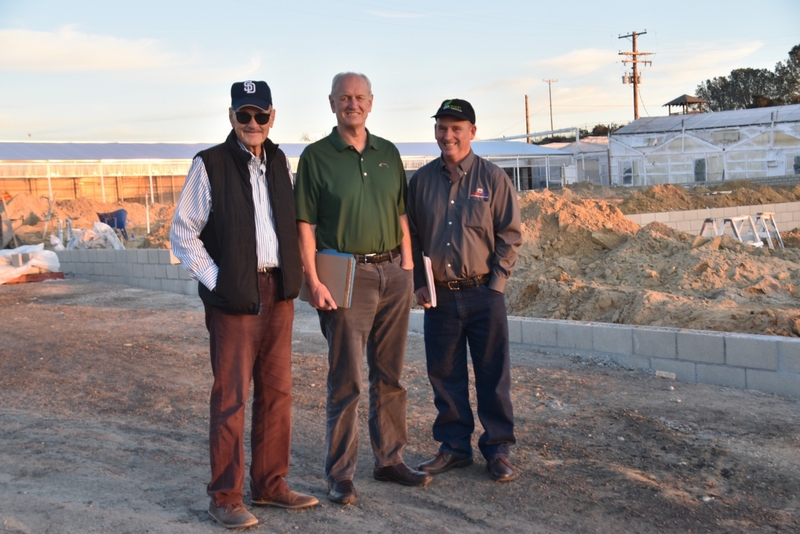 Dempsey Sawyer, John Pound, Jim Bergantz at an early visit to the site. "Agra Tech has done an amazing job in making this happen by tapping into their experience and knowledge," he explained. 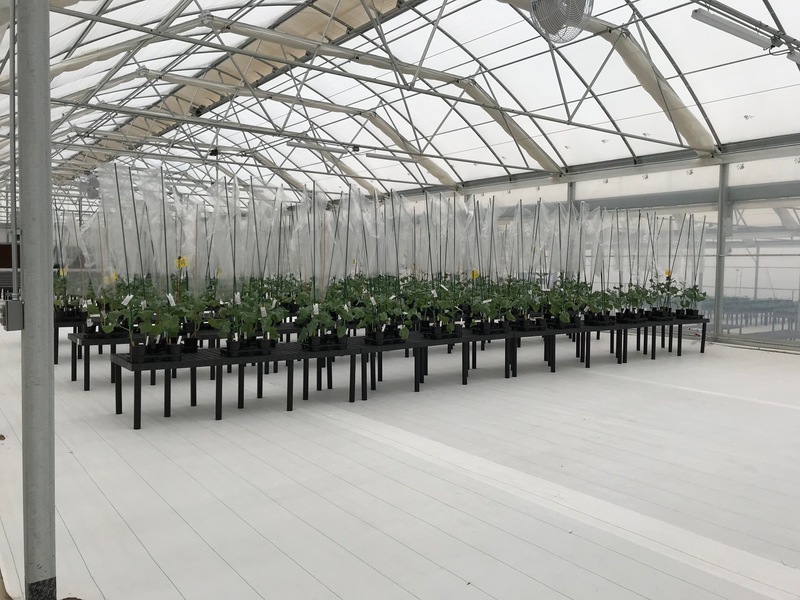 "These greenhouses will be used by new tenants to perform plant research development, so they have to be generic enough so that they can apply to different applications for when they move in. We went with a fairly conservative approach, which is of course attractive to us as the landlord. The market is driving that demand and it's going to be increasing over time, so we wanted to make it simple, so that any tenant that moves in can use these structures the way they want to." The design was a huge piece of the puzzle and the Pound family was ready for the challenge. "It's better to have a flat pad to automate and grow a crop and harvest it with less labor, so we used some different concepts here to achieve that," Sawyer said. "ATI came up with the idea of building small step walls and customizing the gutter systems as well to accommodate each flat pad. That's the most unusual part of the project and where ATI was really instrumental in coming up with some of the structural concepts that have been put into play here." Inside the newly completed greenhouse. Sawyer likes the fact that his location allows him to use certain elements in the greenhouses that can make everyone's lives a little easier, he said. "In this microclimate in Encinitas, where we're located roughly one mile from the ocean, we can use things like double poly roofs without being too concerned about staying in that 65 to 80 degree envelope. 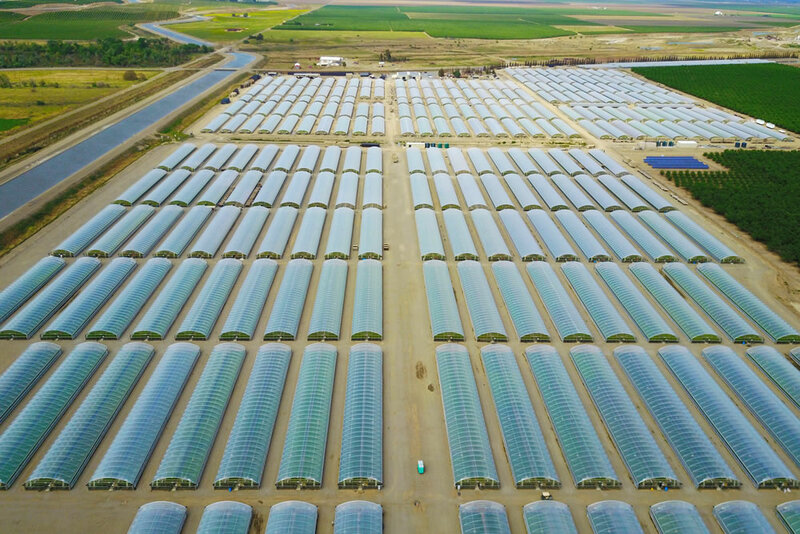 So, we were able to go with minimal mechanical enhancements on these greenhouses based on our location. We get a prevailing wind that comes off the ocean, so we have a fairly stable climate here which makes things a lot more forgiving." 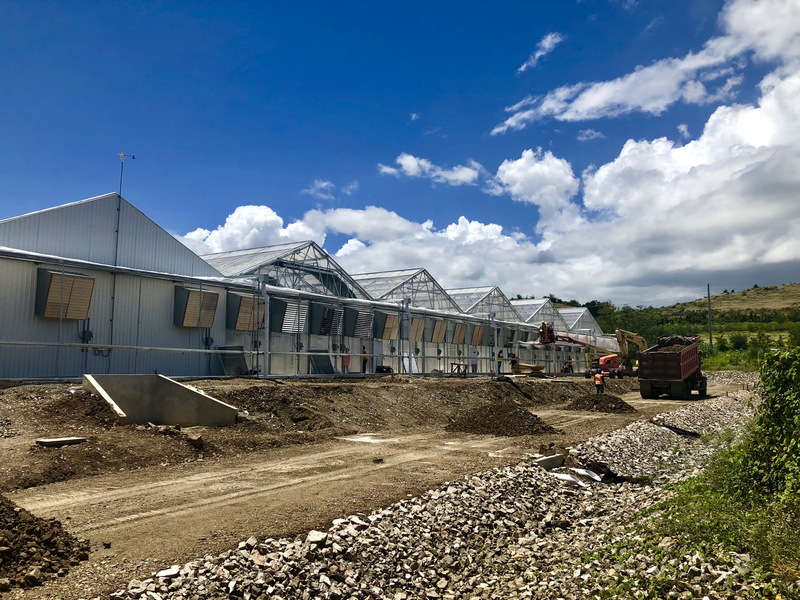 AgCon is currently building the greenhouse and the work is progressing well, Sawyer said. 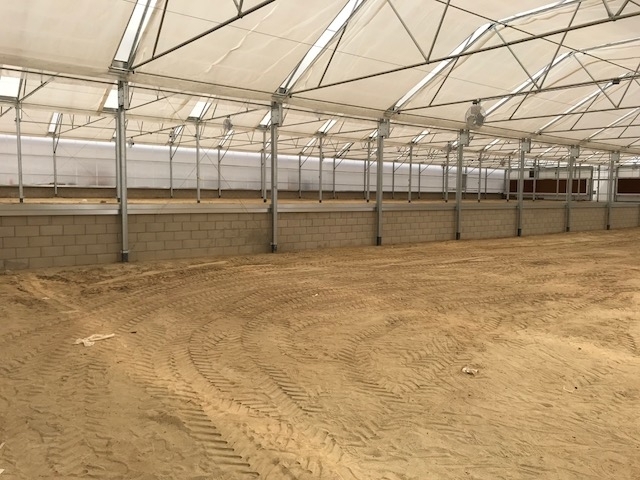 "We tore down an old greenhouse that was there and built the new ones at the same location starting seven months ago and Ray Pound currently has a crew of approximately 11 people here doing an excellent job in building the structures. We are in good hands with them and every day we're seeing the results of that." View from outside showing the insect exclusion with lean-to entry vestibules and fan screens. Since its inception in 1991, the Leichtag Foundation has granted over $119 million to 391 different organizations. Of this amount, over $104 million has been granted since becoming independent in late 2007. About 23% has stayed in Encinitas, CA. Max “Lee” Leichtag and his wife, Andre “Toni” Leichtag co-founded the Leichtag Family Foundation in 1991. Their daughter, Joli Ann Leichtag, was actively involved in the Foundation’s activities until her death. In sustaining our deep respect for and honor of the Leichtags’ charitable intent, in 2011 the Foundation sought to deepen its understanding of the Leichtags’ most closely-held values through personal interviews with family and close friends, including many members of the Leichtag Foundation Board. Currently, the Foundation is supporting programs and educational activities at Leichtag inspired by ancient Jewish traditions that connect people to Ethical consumption; Honoring natural cycles of the earth; Lining the corners of one’s field with food for the stranger and poor; Ecological sustainability; Reserving at least one-tenth of one’s agricultural produce for the poor; The dignity of all creations; Welcoming guests; Fair treatment of those who work the fields; the kind and humane treatment of all animals and healing the world. Thanks guys , Great job.